In this episode (#56) we sit down with the sheriff of Butte County, California, Kory Honea. His county, of course, was ravaged by the Camp Fire which broke out on November 8, 2018. The Town of Paradise, located within his county, was nearly completely destroyed by the fire that was stoked by 55+mile per hour gusts. 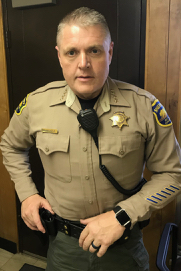 Sheriff Honea is facing a death toll that could exceed 100, managing his law enforcement team as well as mutual aid and keeping his citizens safe while they're displaced from homes that were either destroyed or just can't be reached due to the town's closure. Honea also had the responsibility of evacuating tens of thousands of people to get them out of harms way. He talks about all that, plus some of the more challenging stresses he's faced and how he's dealing with all of the responsibility that goes along with California's deadliest wildfire disaster. Kory L. Honea became the 31st Sheriff of Butte County in May, 2014. Prior to becoming the Sheriff, Honea served as the Undersheriff for nearly four years. Sheriff Honea began his career with the Butte County Sheriff's Office in 1993, when he was hired as a deputy sheriff. Prior to that Sheriff Honea was employed by the Shasta County Sheriff's Office. Attorney's Office, Sheriff Honea promoted through the ranks to become the Chief Investigator in 2008. Sheriff Honea held that position until his return to the Sheriff's Office as Undersheriff in 2010. Sheriff Hone-a holds a Juris Doctorate from the Taft School of Law and is a member of the State Bar of California. He also holds an Associate of Arts degree from Butte College. International Mutual Aid to California: New Zealand Shows It's a "Kiwi Thing to Do"
Heat Wave is Coming to California - How Bad is It? Where at the Hottest Spots? What Can You Do? Rattlesnake Encounters and How to Avoid Them: We're Hands-on for Your Sssafety!